As humans we’re not really equipped to spend much time underwater, but people are finding ever-increasing amounts of things to do beneath the surface. You might never get to be a dolphin or mermaid, or even Bruce the shark from Finding Nemo, but that doesn’t stop you doing some of the more spectacular, thrilling, or most insane things now available to take part in while submerged. Here, then, are ten things – from romantic to electrifying to utterly absurd – you can do while underwater. Burning up the dancefloor, scoffing disco biscuits, throwing shapes with your mates while the latest banger clanks from the sound system – all to be done on dry land, yes? 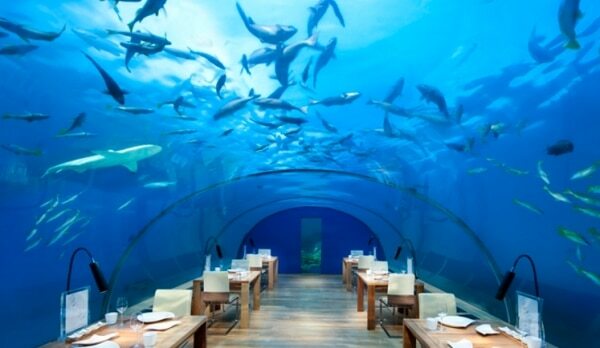 Well actually, no – Subsix, the world’s first underwater nightclub opened in the Maldives, and is situated six metres below the surface so the local marine life can watch while you cut some rug. Also, there’s this TV ad that kind of makes me wish the club it shows it really existed. Something for the Go Freediving Summer Party, perhaps? Want to see Paul McCarpney and Ringo Starfish play live? Then head to the Florida Keys, where its annual Underwater Music Festival has been running for the best part of three decades. Located at Looe Key Reef, you can wave your hands in the ‘air’ to music while submerged, stage ‘dive’ while the show plays around you, or just chill out on one of the party boats on the surface. 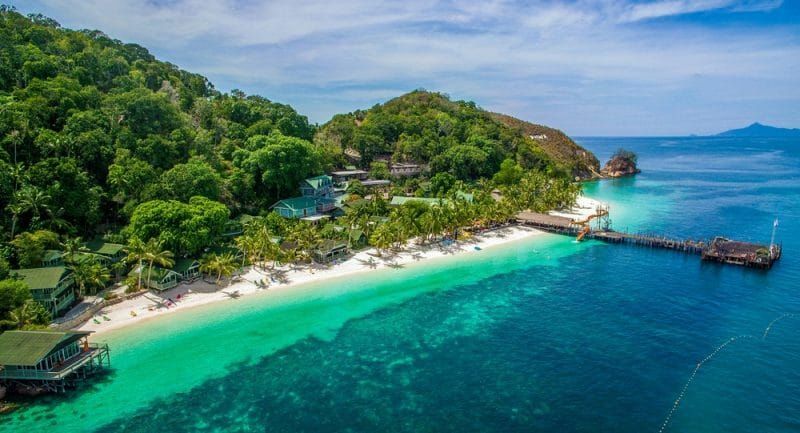 After a long day’s diving a lot of people like to get a good night’s sleep – but what if you never had to leave the water to get some shuteye? If you’re ever in the States, the only underwater hotel in the country is in the Florida Keys: Jules’ Undersea Lodge, named after – you’ve guessed it – Jules Verne, author of 20,000 Leagues Under the Sea. Farther afield there’s the stunning Underwater Room on the Manta Resort, on the island of Pemba just off the east African coastline. Water births are nothing new, and many couples opt for birthing pools at home or in a birth centre or hospital. 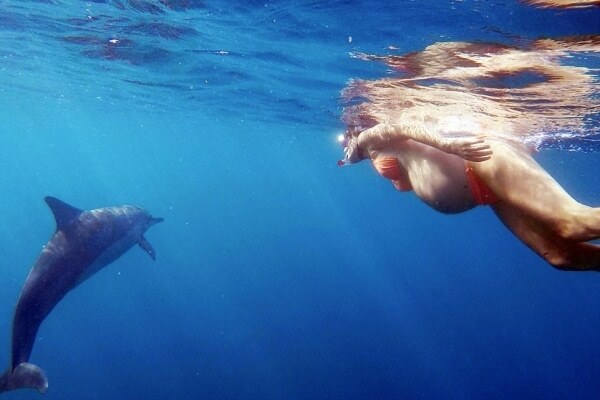 But the sheer scale of choice now available to prospective parents is mind-blowing, so even if you want dolphins to help out as midwives – yes, really – it can be arranged. And culturally, some countries are firm believers in their women giving birth while underwater – Russia, for example, sees lots of babies delivered in summer ‘birth camps’ in the warm lagoons of the Black Sea. Nearly three years in the making and containing 12 installations and over 300 life-size human figures, Museo Atlántico sits off Playa Blanca in Lanzarote, 14 metres below the surface, and is artist Jason deCaires Taylor’s latest stunning underwater sculpture museum. 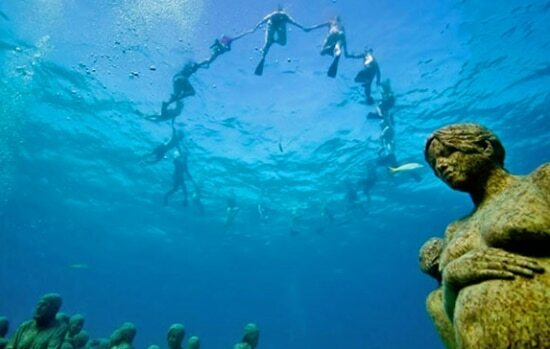 Or if you fancy examining some masterworks in Mexico, head for the MUSA (Underwater Museum of Art) in Cancun, where numerous lifelike sculptures sit frozen in time, with the reef growing on and around them. It comes to us all eventually, so why not go out differently and do it underwater? The biggest artificial reef in the world can be found in Key Biscayne, off the coast of Florida: the Neptune Memorial Reef is man-made and designed as a recreation of the ancient city of Atlantis, and is referred to as a ‘cremation memorial’ location where people can have their remains become part of the site itself or scattered underwater. Initially half an acre, the site is growing in size to a planned 16 acres and can accommodate an estimated 125,000 remains. Emma Farrell is one of the world's leading freediving instructors and the author of the stunning book 'One Breath, a Reflection on Freediving.' Teaching freediving internationally since 2003, she is a founding member of the AIDA Education Commission, writing courses that are taught worldwide, has written her own standalone courses, and has appeared numerous times on television and across other media. She is a freediving judge, has competed internationally, and has worked with gold medal winning Olympic and Paralympic cyclists and swimmers to improve their performance since 2010 using her unique program of freediving and yoga techniques. Find out more about Emma at www.gofreediving.co.uk.